We are getting into summer crazy-time, and during crazy-time it’s easy to forget about things like calibrating and replacing worn nozzles. Think about the cost of all that stuff going through the sprayer, the time of the person applying those materials, and the fuel to power that sprayer Nozzles are small, and they don’t cost much, but they can really contribute to the success of an application and help maximize the bang for your buck on all those OTHER costs. 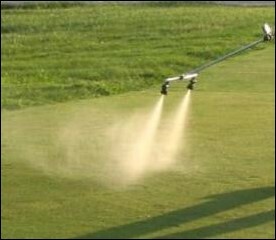 Anyway – as noted in the article cited above, nozzles determine the amount of chemical applied, the uniformity of the application, the coverage, and they can influence the risk of drift. Make sure you calibrate your equipment, replace worn nozzles, and follow all label instructions about application equipment for the materials you are spraying. A worn-out nozzle could easily be allowing 10% or more excess material to be applied, which = 10% more money. Equipment that is not calibrated right might be applying LESS than you need to get adequate control.